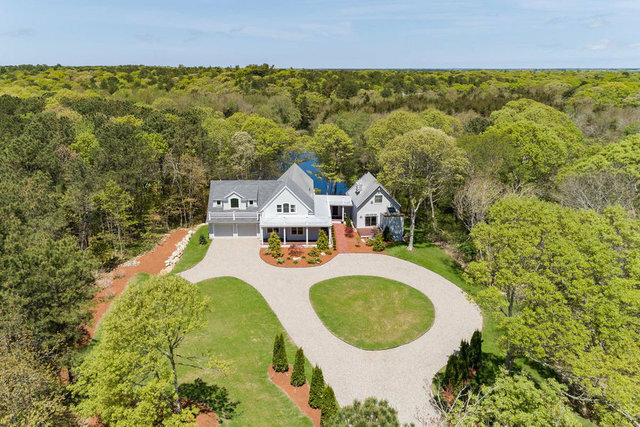 New Seabury waterfront on Leaps Pond, in tranquil setting, with small dock for kayaking, canoeing and more. Here are two connected houses, (with separate entrances), this could be the epitome of welcoming, a full/extended family; to a beautiful waterfront suite; from a larger, prominent, stately main home, with idyllic views. Enjoy a private, set back, three bedroom, rambling, contemporary cape, with a large new addition, new kitchen, two and one half baths, walk-in closets, loft overlooking great room with walls of windows with pond views, entertainment sized deck, and a two-car attached garage. The attached home; or family suite; features two bedrooms, two baths, and a finished basement. Located close to the ocean beach, pool, Poppy Inn, and Marketplace. Check out the 3D virtual tour in the photos!